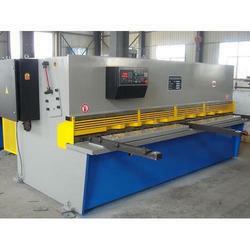 We are among the reputed organizations, highly engaged in offering an optimum quality range of Hydraulic Shearing Machine. The stable robust, all welded steel frame from ultra sonically tested plates are of top quality. The top beam is guided by three point roller with replaceable hardened liners for least wear. In this machine, Raw and table designed with special inclined member and box type structure for maximum strength.